Rock Star Gary reflects on WCW Clash of the Champions XXV – Scotts Blog of Doom! Holy supershow debuts, Batman! 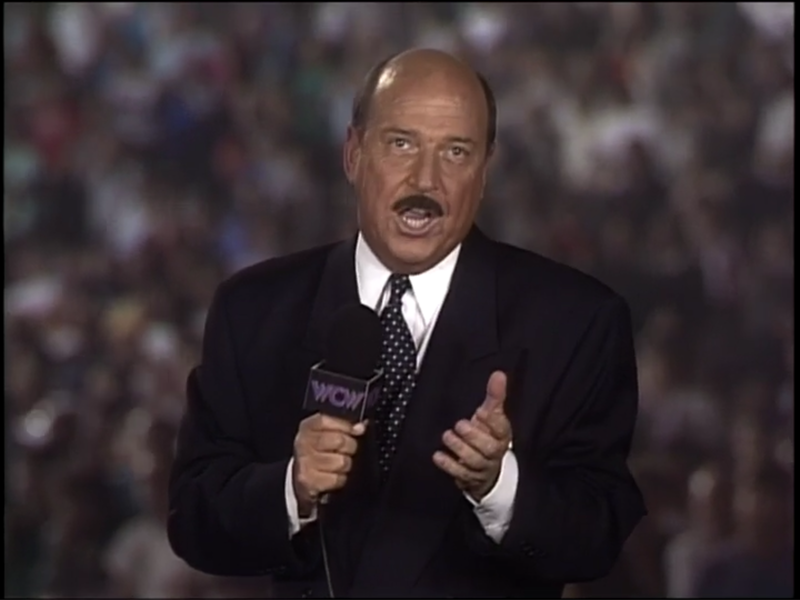 “Mean” Gene Okerlund, who made his WCW debut this past weekend on WCW Saturday Night, opens the show, shills the WCW hotline, and makes a parachutist joke about Ventura. Wow! Both promotions take aim at Fan man, and he thought he got it rough from the spectators in Vegas. Rude entered first. Hey, that’s not tradition! I guess WCW felt Rude should insult the “Florida flunkies” who milked free tickets for the show. When Hawk no-sold a shot to the top turnbuckle, he provided Rude with a ten-top-turnbuckle count-along. He then backdropped, slammed, and suplexed Rude for 2. As he gave Rude a cross corner whip, Hawk succumbed to a backbreaker. Rude then mounted the top turnbuckle, leaped, but ate boot. After Hawk clotheslined him to the floor, he followed Rude only to eat the apron twice. Rude then clotheslined Hawk on the floor while referee Randy Anderson called for the bell. When Anderson ruled the bout a double countout, Hawk made Rude HIT THE POLE. Summary: Speaking of nontraditional, a World title match opener with a screwy finish. BOOOOOOOOOOOOOOOOOOO! Must I watch this? 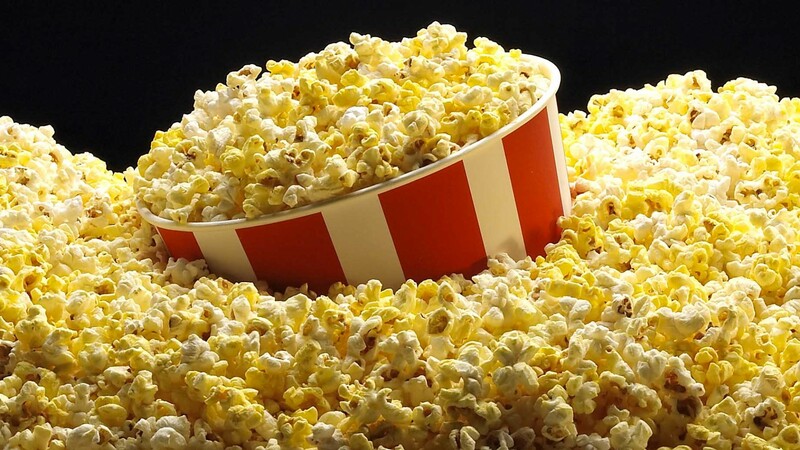 Like you, I’ll just go make some popcorn. Equalizer rammed Shockmaster back-first into the corner and followed with a running guillotine. As he delivered a belly-to-back suplex, Equalizer got 2. Shockmaster rebounded with a big boot and gave Equalizer a cross corner whip. When Equalizer exploded from the corner with a clothesline, he couldn’t take Shockmaster off his feet. Shockmaster then hit the bear hug slam and pinned Equalizer. Summary: Thank goodness it was short. This show is off to an inauspicious start. Atop a podium, Okerlund interviews Colonel Parker who claims that he dropped Sid Vicious like a “hot potato” and picked up Austin. To explain Vicious’ absence, Parker took out a restraining order. Obviously, neither was Vicious in no condition to make a TV appearance nor was WCW willing to put him on TV pending disciplinary measures against him and Arn Anderson. When he supplied Regal with a shoulder block and hip toss, Badd earned a pair of 2-counts. He then hooked a sunset flip for another 2. As the St. Pete faithful chanted “bo-ring,” Badd attempted a cross body block, but Regal evaded him. Ventura then made a Jim Valvano reference while Regal delivered a double underhook suplex. 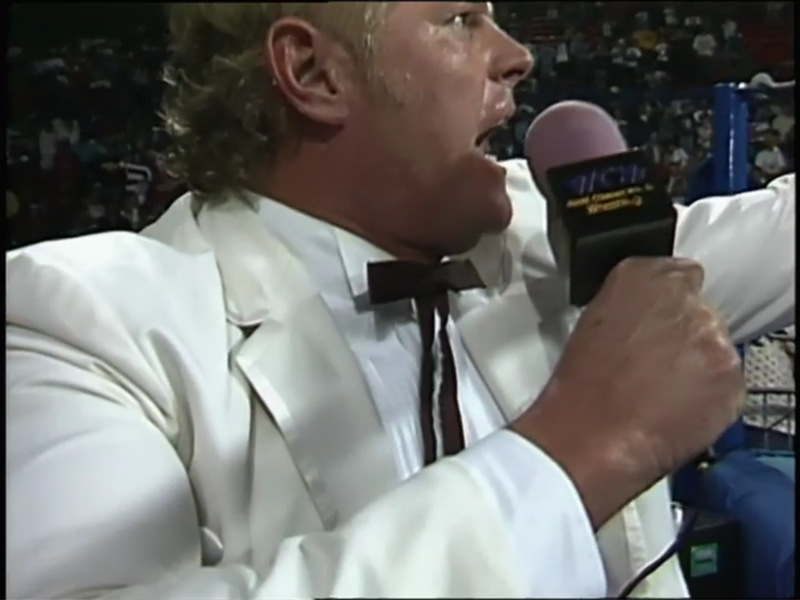 After Schiavone mentioned a challenge from the “British Bulldog” Davey Boy Smith to Rude, Regal got 2. Badd then hit the Kiss that Don’t Miss, and Regal was OUT COLD. Sir William then got up on the apron to protest but got nowhere. When Badd made the cover, he initially grabbed the far leg but switched to the near one. That enabled Sir William to place Regal’s right leg on the bottom rope. SNEAKY! As Badd chastised Sir William for his shenanigans, Regal rolled up Badd while hooking the tights. Summary: Despite Badd’s energy, there was a bit of a styles clash. I smell a long title reign for his Lordship. Although the break-up of the Hollywood Blonds was considered political by both Austin and Pillman, their onscreen breakup occurred on the 10/30 episode of WCW Saturday Night. As Austin entered the ring, Pillman attacked him immediately. He then chased after Parker but ate a clothesline on the floor due to a sneak attack by Austin. When Pillman reversed an Irish whip on the floor, he made Austin taste the steel railing. It must have tasted like the Big Gooey at Willy’s. Back in the ring, Pillman backdropped Austin and followed with a flying headscissors. On the ramp, Austin attempted a piledriver, but Pillman backdropped him again. He then mounted the top turnbuckle, leaped, but ate boot. After Austin got to his feet, he tossed Pillman to the floor causing him to taste the steel railing. Waiter, could you give the curly-haired former Hollywood Blond a Wicked Wiily? Austin then leaped from the ramp and delivered a double axe handle. With Pillman on the apron, he hit a springboard cross body block for 2. Austin rebounded with a top rope guillotine for 2. As Austin applied a rope-assisted single-leg crab, Schiavone contemplated the Blonds reuniting for Battlebowl ‘93 on 11/20. Patrick then noticed Austin’s chicanery which sparked Pillman’s comeback. When Austin gave him a cross corner whip, Pillman leaped to the second turnbuckle and landed a flying back elbow. Austin then mounted the top turnbuckle, but Pillman crotched him. After he joined Austin, Pillman attempted a superplex. On the other hand, Austin blocked it and countered with a front suplex down to the mat. Austin then leaped from the second turnbuckle, but Pillman caught him in mid-air with a dropkick for 2. As Austin attempted another piledriver, Pillman countered with a huracanrana for another 2. He then gave Austin a cross corner whip, got vaulted to the apron, and attempted a springboard maneuver. When Austin countered with a powerslam, he got 2. He then attempted a running guillotine but came up empty. After Pillman hit a DDT, he got 2. He then attempted a crucifix, but Austin countered with a Samoan drop. As Austin mounted the top turnbuckle, he leaped, but there wasn’t any water in the pool. Pillman then hooked an Oklahoma roll for another 2. When Austin reversed an Irish whip, he attempted a stungun but ultimately tossed Pillman over the top rope to the apron. Pillman then attempted another springboard maneuver, but Parker tripped him. How dastardly! Summary: Although the match had a cheap finish, it made sense due to Austin’s new association with Parker. Perhaps these two will confront one another at the PPV. After the match, Pillman nails Austin sending him to the floor. Parker then hightails it immediately before Pillman could pluck him. BATTLEBOWL CONTROL CENTER: Okerlund shills BattleBowl ‘93 LIVE on PPV on 11/20. In a pre-recorded interview, Orndorff vows to win BattleBowl. Sting then cuts a generic promo. To wake up the slumbering elderly, Dusty used his natural charisma to get under the Assassin’s copious amounts of skin. The St. Pete faithful responded with a “Dust-y” chant. Orndorff leap-frogged him, but Dustin slammed him twice. While the St. Pete faithful chanted “Paul-a,” Dustin sent their nemesis shoulder-first into the top turnbuckle. Orndorff then gave Dustin a cross corner whip but ate knee on his follow-through. When he rammed Dustin face-first into the mat, Orndorff delivered a belly-to-back suplex. He then hit an elbow smash, but Dustin countered a hip toss with a backslide for 2. As Dustin delivered a clothesline, he got another 2. Orndorff then used momentum to send Dustin face-first into the top turnbuckle. After he gave Dustin a cross corner whip, Orndorff clotheslined him. Dustin rebounded with a lariat for 2. When Dustin attempted a bulldog, Orndorff escaped at the last possible second. Dustin then hooked a sunset flip for another 2. As Orndorff signaled for and attempted a piledriver, Dustin backdropped him. Orndorff then mounted the top turnbuckle but missed a flying knee drop. After Dustin secured an inside cradle, he pinned Orndorff. Summary: Lots of mat wrestling with a decent finish. Orndorff made Dustin look good. After the match, Orndorff clotheslines Dustin over the top rope to the floor. The Assassin then makes Dustin HIT THE POLE. To a raucous ovation, Dusty CLOBBERS the Assassin with a bionic elbow. He then tosses the Assassin into the ring and LEVELS him with more bionic elbows. When Dusty tries to remove the Assassin’s mask, Orndorff rescues his manager by hitting Dusty. The Assassin then grabs the US title belt and BLASTS Dusty with it. As Orndorff attempts to piledrive Dusty, Dustin hits a lariat to send the heels scurrying. From the podium, Okerlund again shills the hotline and Starrcade ‘93. In the ring, Sting paired off with Knobbs while Smith paired off with Sags on the ramp. Sting delivered an elbow drop, and Smith clotheslined Sags. As Rude snuck up behind him, he delivered a Rude Awakening to Smith on the ramp. So THAT’S why his match led off the broadcast. Hawk came out to check on Smith, and Sting realized his partner was FUBAR outside the ring. When he assisted Smith to their corner, Sting got double-teamed until he double-clotheslined the Nasty Boys. He then hit consecutive dropkicks, mounted the top turnbuckle, and delivered an axe handle to Knobbs for 2. After Sags tried to interfere, Sting dumped him back down to the floor. Perhaps Sags and Hyatt can trade stories about getting dumped. Meanwhile, Sting supplied Knobbs with a back elbow and checked on Smith. Sags tagged in, but Sting hit an elbow drop for 2. As he gave Sags a cross corner whip, Sting followed with a corner clothesline. He then face-planted and slammed Sags before mounting the top turnbuckle. While Hyatt allegedly propositioned referee Nick Patrick, Knobbs shoved Sting down to the mat. Schiavone then referenced Rude’s use of a foreign object to win the International World title, so Ventura questioned whether or not Rude obtained it from outside the US. HA! When Knobbs tagged in, he delivered an elbow drop followed by a gutwrench suplex. He then distracted Patrick so that Sags could toss Sting over the top rope to the floor. Nefarious! After Sting returned to the apron, Knobbs suplexed him back into the ring for 2. Knobbs then applied a bear hug while Smith finally regained his footing in the babyface corner. As Sting countered with his own bear hug, he converted it into an overhead belly-to-belly suplex. Sags tagged in and tossed Sting down to the floor. When Sags distracted Patrick, Knobbs gave Sting the business with his jacket on the floor. Devious! Knobbs tagged in while Schiavone tried to maintain decorum on commentary. After Sting escaped a rear chin lock, tags were exchanged on both sides. Smith then powerslammed both Sags and Knobbs consecutively before offering dropkicks to each of them. As he double-face-planted both Nasty Boys, Smith double-clotheslined them. He then provided them with a double DDT, gorilla-pressed Sting, and tossed him atop both Nasty Boys. With all four wrestlers in the ring, Smith hit a running powerslam to Knobbs. Patrick then returned Sting to the babyface corner while Sags mounted the top turnbuckle. When Sags DEMOLISHED Smith with a flying elbow drop, Knobbs pinned Smith. Summary: Believable story as Sting and Smith would have steamrolled the Nasty Boys had Rude not injured Smith before the match. With that being said, Sting had a lot to overcome, so the finish made sense. Backstage, Parker informs Flair that Austin will challenge the winner of the main event. Flair looks disinterested until Parker touches him. Oops. Flair then WALLOPS Parker, and WCW Security Director Doug Dellinger removes him from the area. Following a commercial break, Flair slammed Race and hooked him in a figure-four leg lock. To rescue his manager, Vader stormed into the ring and splashed Flair. He then delivered a short-arm clothesline, gorilla-press-slammed him, mounted the top turnbuckle, and hit a Vader bomb. When Flair rallied, Vader halted it with a running body block. He then gave Flair a cross corner whip that resulted in a Flair flip to the floor. As Vader distracted referee Randy Anderson, Race made Flair taste the steel railing. It must have tasted like Fat Back at the Burg. With Flair leaning against the steel railing, Vader leaped from the apron but tasted it instead of SQUISHING Flair. Waiter, could you give the extra-large red-headed behemoth a Whole Hog? Flair then mounted the top turnbuckle and delivered an axe handle to Vader on the floor. After Vader removed his headgear, Flair gave him a cross corner whip followed by a chop. He then gave Vader another cross corner whip but ate boot on his follow-through. When Vader mounted the second turnbuckle, he attempted a senton splash but came up empty. Flair then hooked a figure-four leg lock, but Vader grabbed the bottom rope to escape. With Flair on the apron, Vader suplexed him back into the ring. He then splashed Flair for 2. As Vader mounted an adjacent second turnbuckle, he leaped, but Flair “powerslammed” him. Either a poor camera angle was involved or Flair was out of position. Nonetheless, Flair got 2. Vader’s kick-out sent Flair to the floor, but Flair rebounded by mounting the top turnbuckle. After Flair hit another axe handle, Vader reversed a cross corner whip. A second Flair flip knocked cameraman Jackie Crockett into the middle of 1994, but Flair caught his balance, mounted the same top turnbuckle, and landed a third axe handle. When Flair gave him another cross corner whip, Vader inadvertently clotheslined Anderson. Flair then mounted an adjacent top turnbuckle, leaped, but Vader caught him. As Vader placed him atop the top turnbuckle, he joined and superplexed Flair from the top turnbuckle. Wow! He then mounted the top turnbuckle but missed a moonsault. The St. Pete faithful ERUPTED! For some unknown reason, Anderson changed his mind and disqualified Vader. As a result, Vader retained. Summary: OK…why didn’t the title change hands here? A mostly-comped crowd on a free national cable broadcast would mean they gave away the title change for free. In essence, save it for the PPV! After the match, Parker enters the ring, but Flair nails him. Austin follows Parker into the ring and brawls with Flair. While Vader joins Austin in pummeling Flair, Dustin Rhodes and the Shockmaster hit the ring to chase the heels away. Okerlund climbs into the ring and interviews Flair. 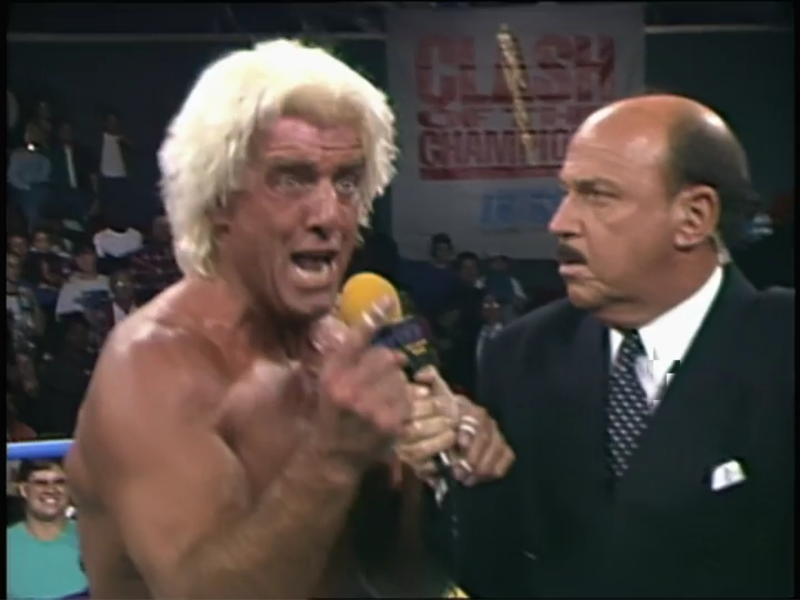 To set up a tag match for WCW Saturday Night, Flair challenges both Austin and Vader as he promises Vicious as his partner. Parker accepts the challenge on behalf of Austin and Vader. Conclusion: I truly wanted to hate this show, but between Austin-Pillman and Flair-Vader, I just can’t. Also, blame the bookerman, but even I enjoyed his brief battle with the Assassin. The rest is filler, so fast-forward accordingly..
See you for WCW Battlebowl ‘93!